King Cetshwayo District Municipality (formerly Uthungulu District Municipality) is one of the 11 district municipalities ("districts") of KwaZulu-Natal province in South Africa. The seat of the district is Richards Bay. 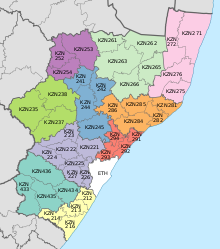 The majority of its 885 944 people speak Zulu (2001 Census). The district code is DC28. It is named after Cetshwayo kaMpande, King of the Zulu Kingdom from 1872 to 1879, who led his nation to victory against the British in the Battle of Isandlwana. King Cetshwayo District is officially a sister city of Milwaukee, Wisconsin, USA ( Milwaukee, United States). The joining of the two cities was largely enacted from legislation in Wisconsin in collaboration with the Africa Urban Poverty Alleviation Program. In 2009, Sister Cities International launched the Africa Urban Poverty Alleviation Program, a three-year project to alleviate poverty in 25 African cities (including King Cetshwayo District) through water, sanitation and health initiatives. Milwaukee will collaborate with their African counterparts to identify and address the most critical problems in these sectors, which form barriers to sustained development in urban areas. This project is funded by a $7.5 million grant from the Bill & Melinda Gates Foundation. The program is cited to end in middle of the year 2012. Election results for uThungulu (King Cetshwayo District) in the South African general election, 2004. ^ Khoza, Amanda (27 July 2016). "Zwelithini welcomes renaming of uThungulu to King Cetshwayo District Municipality". News24. Retrieved 3 September 2016. This page was last edited on 16 September 2018, at 23:44 (UTC).